Whenever we look for new trades, we always look to see where there is the greatest amount of value. While we are technical traders by definition, the idea of getting good value on a trade is not lost upon us. We have noted that whenever the overall market is overbought (as it had been at that point), you either stop trading and wait for a clear signal that the pullback has begun or you continue to enter long trades but make your search criteria more strict and only select stocks that appear undervalued or those that have undervalued call options. In the world of derivatives, call options give the holder the option (but not the obligation) to buy a security at a certain price and before a certain date. ADP was a reasonably priced stock that had broken above resistance to a new 52 week high after consolidating for a period of three weeks. Most of the proprietary indicators we use were also pointing to higher prices for ADP including three different relative strength (RSI) readings. Whenever you have multiple positive RSI readings it’s a very strong indicator of future prices. However, the value was not in trading the equity but rather in trading a call option that we felt was highly undervalued. When we ran the numbers through our software, our suspicions were confirmed and we decided to enter the ADP May 60 Calls at $2.35. This gave us the benefit of being in a stock that we felt was poised for more gains in a market that was already hot and it also limited our downside risk in the event that the overall market cooled off. We did consider a married put strategy as well but the difference in value was immaterial, and we felt that we could deploy our capital in a more efficient manner by spending only $235 for a hundred shares rather than approx. $6,100 for the shares and then another $220-$250 for the put option. Over the next few days, ADP did exactly what we did not want – it started going down. However, we knew that the option was still undervalued and that our risk was limited, so we held on to the trade. In week two and week three, ADP started to pick up momentum and began moving upward. 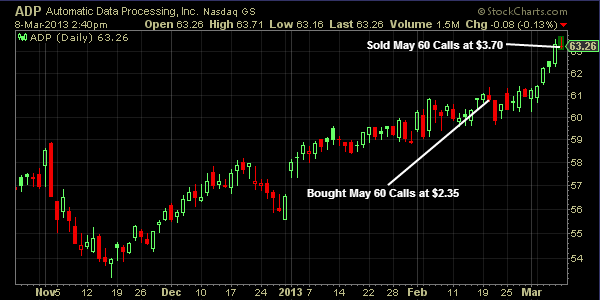 We had considered selling our calls near the beginning of March when they were trading at approx. $2.90, which would have given us a great return but our analysis was showing signs of further gains. Therefore, we held on until March 7, when momentum in ADP began to wane. Both our money flow and velocity indicators were showing signs of exhaustion. They don’t always identify perfect tops but keep us in a trade long enough to make great returns. On March 8, we sold our ADP calls at an average price of $3.70 per contract, for a total profit of $1.35 per contract or 57.44% in 14 trading days. If we had traded the stock only, our gain would have been 3.80% and we would have had over $6,000 invested over that time. These are the types of trades we love to execute - low investment with unlimited upside potential. If you’re not a member, why not check out our free trial at https://tradingwins.com and get full access to all of our trades live as they happen. You don’t even need a credit card to start.